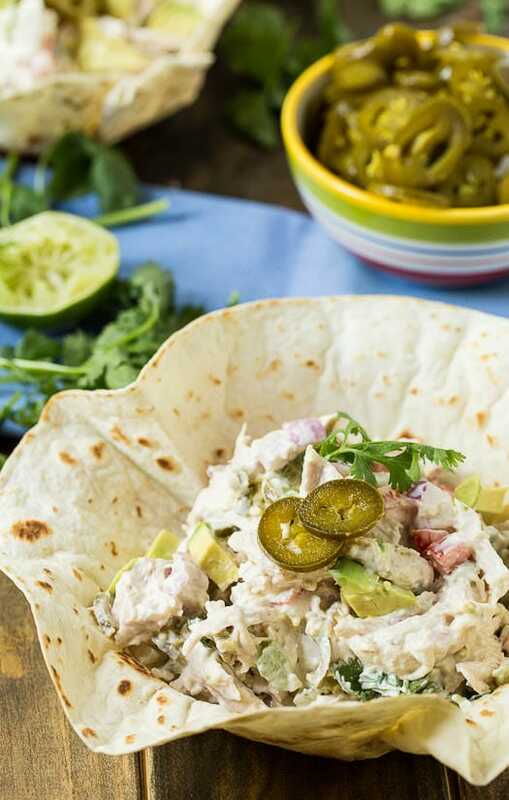 This Jalapeno Chicken Salad has a mayonnaise base and is spiced up with pickled jalapenos. 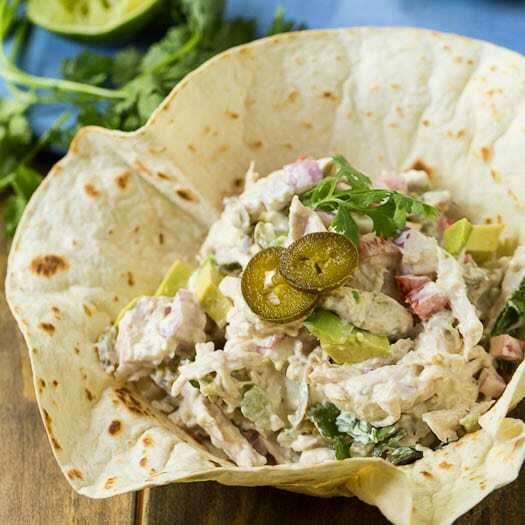 Serve it in a crisp tortilla bowl for a fun and delicious chicken salad southwestern style. Chicken Salad is without a doubt one of my Top 5 favorite things to eat for lunch. I love the creaminess of it and I usually like it chock full of nuts (pecans or almonds) and fruit (grapes or dried cranberries). But every now and then I like to add some heat to my chicken salad and this Jalapeno Chicken Salad is the perfect spicy version. It’s simple to make. Mix some shredded chicken with mayonnaise, lime juice, a little ground cumin, celery, red onion, red bell pepper, avocado, and fresh cilantro. Plus a heavy dose of chopped pickled jalapenos. The pickled jalapeno and lime juice really add some zest and the cool and creamy avocado helps cool it down some. Instead of serving it on bread, it’s fun to make simple tortilla bowls. Just heat a tortilla in a skillet until very pliable. Then shape it over an upside down bowl. Leave it that way until it cools and voila! You have an edible bowl for your chicken salad. So next time you’re in the mood for chicken salad, try this south of the border version. I think you’ll love it! 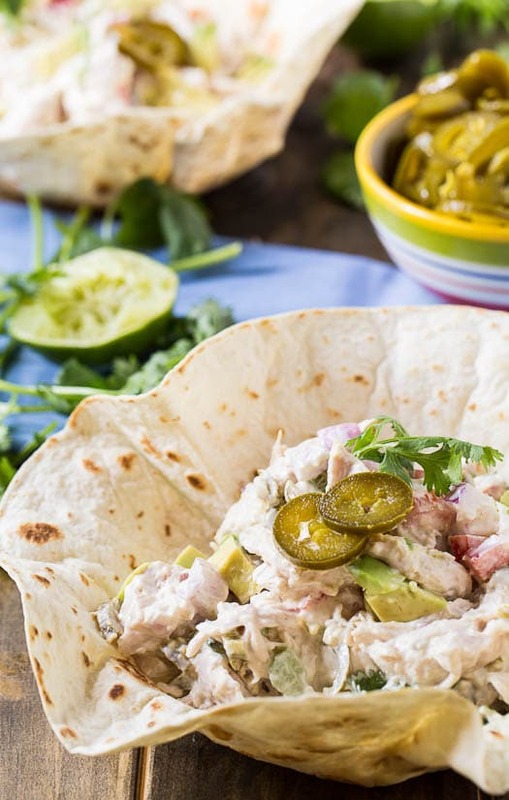 Creamy Jalapeno Chicken Salad has a little zip from pickled jalapenos and lime juice. Serve in a homemade tortilla bowl for a fun presentation. In a medium bowl, stir together mayonnaise, lime juice, and cumin. Add chicken, celery, red bell pepper, red onion, avocado, cilantro, and pickled jalapenos. Stir well to combine. Heat a nonstick skillet over medium heat. One at a time, spray both sides of a tortilla with cooking spray and heat, flipping half way through, in skillet until soft and pliable and beginning to get brown spots. Quickly place tortilla over an overturned bowl, use your hands to shape it around the bowl. Let cool. To serve, place about 1 1/3 cups of chicken salad in each tortilla cup. This entry was posted in Lunch, Salads and tagged chicken, jalapenos, poultry. Bookmark the permalink. This is an awesome recipe for a chicken salad! Definitely better than any other chicken salad I have ever made.. I need to recreate the recipe! Pinned! This looks superb, I NEED to make this ASAP! I love this idea for chicken salad. Thanks for sharing the recipe. Pinned. What an awesome twist on chicken salad! With those pickled jalapeno peppers… man this sounds good! Have a great weekend!! Love the presentation and that chicken salad sounds so good. What a fun version of chicken salad which I am extremely fond of. It was a fun surprise to find you had put it in a taco shell. Of course it would make a great sandwich filling too. This salad looks amazing! Love the addition of jalapeno! The men in my life (aka my husband and boys) would love this! They are all about the heat. Looks like a perfect lunch. Christin, this chicken salad is SOO up my alley! I adore anything with a punch of heat and I love pickled jalapenos! This is such a fun way to shake up normally-boring chicken salad. Knowing me, I would probably go crazy with the jalapenos and throw in a ton. 😀 Pinned! I love anything with pickled jalapenos! This is a great change-up to the usual chicken salad. Looks delicious! This chicken salad looks awesome served in the flour tortilla bowl – so fun! I love the creamy avocado along with the spicy kick from the pickled jalapeños – it sounds amazing! You really made me craving for some. Looks wonderful. It seems like a delicious idea. This looks so fresh, crunchy, and delicious! Love the addition of the pickled jalapeño! I love chicken salad! The little tortilla bowls you served these in are such a fun idea, love them! I love chicken salad for lunch too! My husband always requests that I add jalapenos to whatever kind I am making because he loves the spicy kick. Love that you serve it in a tortilla bowl, I definitely need to try that! This salad looks perfect for a filling lunch! I love all of the flavors in here, especially the cilantro and jalapenos. Beautiful presentation, too! I echo you, chicken salad has to be one of my top favorite lunches — put a spicy twist on it, and I’m in serious lunch heaven!